1. Unique, independent restaurants, cafes, coffeehouses, bars (preferably half the number of venues) so the area is worth visiting in the first place. 2. Outdoor seating for all of the above, providing a strong sense of street life. 3. Significant amounts of housing surrounding the district, ideally also above the first or second floors of the pedestrian street. 4. Lots of trees to provide shade, motivating people to stay longer. 1. Don’t base decisions on failed downtown pedestrian malls in the 1970s and 1980s. Practically nothing prospered in downtowns during that period. 2. Terminating the street with a key building or landmark provides a much more comforting sense of being in an outdoor room. 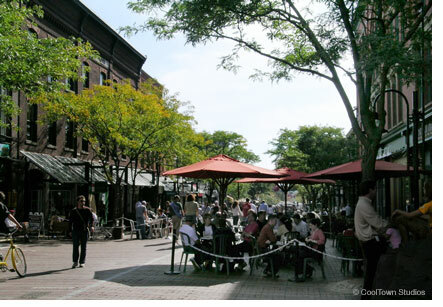 Curving or organically crooked streets also help provide this sense of place. 3. Make them one block at first to hedge your risk. Mid-block paseos work well in this regard. 4. Ensure you’re near a university and/or transit, parking, housing to provide foot traffic. 5. Brick pave them for human-scaling. 6. Run the architectural review/management through a main street program for quality control. 7. Engineer two-way streets around the pedestrian zone to keep traffic flowing efficiently. 8. Plan a variety of events, as a ‘stage’ is now set for entertainment and community building. You now have a city icon; a compelling reason to come to the downtown that’s safe for everyone, and something unique to pass the postcard test. It’s not that difficult, it just needs progressive leadership.